I've come across a 6105-8000 that reads water 150m proof on the dial & waterproof on the case back. Per an article on Worn & Wound "the early models from 1970 were labeled “water 150m proof” on the dial, and “waterproof” on the case back. At some point later that year, they changed the text to “water 150m resist” with “water resistant” on the back". So my question is does having one that reads "waterproof" more rare (thus more valuable) than one that reads "water resistant? If so by how much in today's market ? With the 6105 8000 you'll probably find the majority are Proof/Proof with a comparatively small number of Resist/Resist. 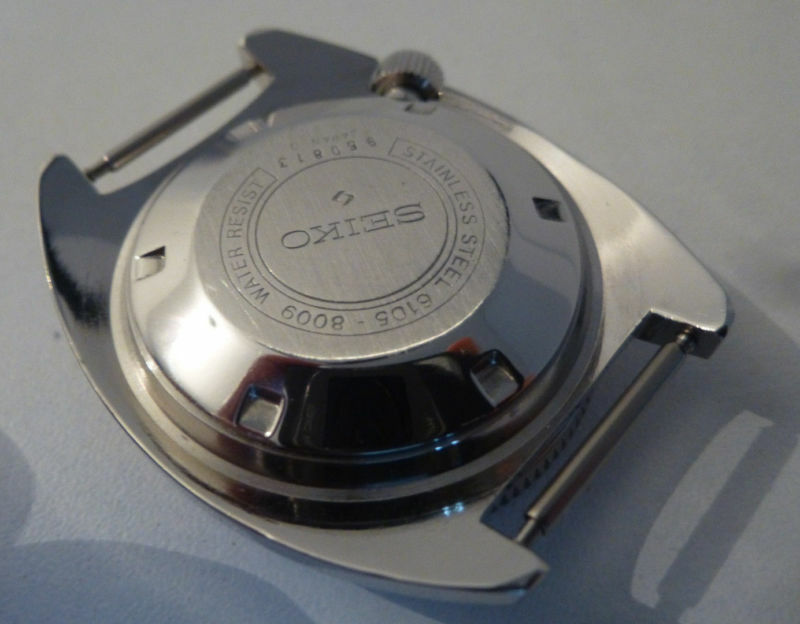 There are also Resist(dial)/Proof(caseback) examples. The W&W text you quote is a bit misleading as it notes the changeover date but ignores the fact that 6105 8000s were made for several years before 1970 and they were all Proof/Proof. People tend to prefer Proof/Proof but condition and originality will be a much bigger factor. Neither are that rare. Just find one in good condition worth its asking price. A beauty went on eBay the other day for £560 ish. They both go for the same sorta prices really. The Proof version of the 8110 is very rare however. Produced only for a few months. 8000s stem from 67? To up to 72/3 I believe. Transition around 70 gives you an idea. I had s resist version from 69 which was probably one of the earliest to see the change of dial text. I don't think I've ever seen a Resist version if the 6105-8000 mind you. Only ever 8009s have had both variations. Dang it, guys ^ now i think I want one!! Thanks for the info, W&W is indeed a bit misleading noting that the 6105 was mfg in 1970 w/an early version being proof/proof. Lead me to think that a 1970 one would equal it being rare. Depends on which 6105 they're talking about. But if it's the 1st generation symmetrical cased 6105-8000/9, then yes. SEIKO 6105 collection guide: with no.1 as top priority and no.5 as least. This is based on length of production date and scarcity. Finding a good condition 6105 is hard to find because most of these tool watches were used and abused through the years. Some were lucky and ended up as drawer queens..stored and forgotten and recently found. Most Seiko hobbyist would love to own one. I became a Seikoholic because of this damn watch....but it was worth it because the journey was memorable and in the end....I was able to acquire all 6105 models (with some still attached to their original waffle and XGL rubber straps). The resist resist 6105-8009 is not just 1970, asap3. There are reportedly 6105-8000 resist versions according to Erik Strickland. Here is one I used to have dated May 1969. I've seen 69 up to 71, and one I've seen on here that's very late dated 72. Not as many, sure. but not only 1970 and not only 8009s. Pleasure asap3. Would be good to see some consistent examples from 69/71 and 72. Get an idea just how many there might be. The 72 one could very well be like the 78 or was it 79 6105-8110 case that could have been a late service case, but I wouldn't be surprised if there are a few more.